The hidden land of Dolpo, was first settled by Rokpa farmers and Drokpa nomads from Tibet in the 10th century. It is one of the highest inhabited places on earth, with scattered fortress-like villages and monasteries nestling amongst mountains of stark, ascetic beauty. Though part of Nepal today, Dolpo remains culturally and economically firmly tied to Tibet, the people of this desolate area are cut of from their southern neighbours by snow-covered passes for much of the year. This is fascinating and difficult country to travel in. Most of Dolpo is protected by Shey Phoksundo National Park. 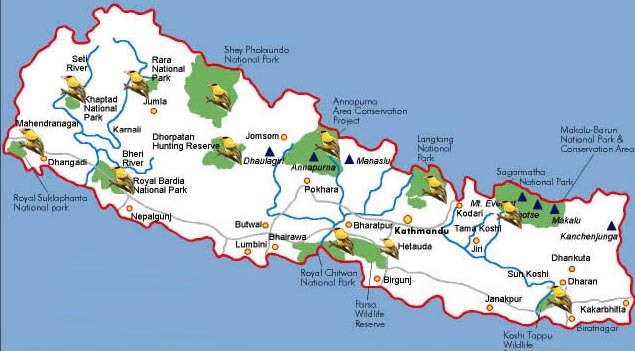 It is bounded in the east and south by Dhaulagiri and Churen Himal ranges and in the west by the Jumla district. Dolpo has been bypassed by development and until recently by tourism. Although a few Anthropologists and geographers had explored the region, the entire district was closed of to foreigners until 1989, when southern parts of Dolpo was opened to organised trekking groups. Dolpo is Bon-pro country, where people practice a shamanistic religion predating Tibetan Buddhism. Much of Bon-po symbolism is the opposite of Buddhist practice. You should walk to the right of ancient mud chortens, which are inscribed with swastikas with their arms pointing in the opposite direction to the Buddhist chant of "om mani padme hum", the Bon-pos chant 'om ma tri mu ye sa le du", in Tibetan means "in clarity unite'. We fly from Kathmandu to Nepalganj in the southwest part of the Terai, right on the border to India. After checking into our hotel we might go and have a look at the Bageshwari Mandir, a temple to honour Kali. But what Nepalganj is all about is just wandering around in the bazaar, which has everything on sale that one could imagine. We will see people here from every part of Nepal, people from Tibet and India; they all come here to trade. We go to the airport very early in order to get on the flight to Juphal. Dolpo flights are always early in the morning. This is because high winds in the Thulo Bheri Valley begin around 10 am, making later flights impossible. Once we have gotten all our equipment of the Twin otter in Juphal (2500m), we start out on the short walk from Juphal to Dunai. We walk downhill through meadows and past a few houses to the small hotels at Kala Gaura (2090m). From here we follow the river trail upstream to Dunai. We camp near Dunai and explore this bustling little hill town for the rest of the afternoon. We start trekking from Dunai, cross the big steel suspension bridge and turn west, following the trail past the hospital, and then it's a level walk along the bank of the Thulo Bheri to its confluence with the Suli Gaad at 2070m. We follow the new trail north up the east bank of the Suli Gaad to a collection of teashops run by the wives of army personnel in Dunai. Another hour of walking takes us to Kal Rupi and then on to Raktang (2260m). We cross to the west bank and trek past numerous goths and horses pastures over a ridge to the rough stone houses of Jyalhasa, a wintering spot for the people of Ringmo. We keep walking upstream to another bridge, cross it to the east bank, and make our way past some crude teashops and a bridge over a side stream, the Ankhe Khola, at 2460m. The trail makes some ups and downs through grass and ferns to a trail junction. The fork is the old trail leading to the army and national park post at Ankhe, and on to the old trail that passes the villages of Rahagoan and Parela, high on the ridge above. These three villages a strange name connection: Parela (parela means eye-lashes), Rahagoan (raha means eyebrow) and Ankhe (ankha is eye). The trail Phoksundo Lake climbs over a ridge at 2710m, then descends on a rocky path to Chepka (2670m), which is inhabited by three brothers and consists of collection of interconnected shops, rakshi stalls and lodges. We camp here or at another good spot beside a huge rock in walnut grove about 20 minutes beyond Chepka. We follow the Suli Gaad valley, which turns eastward and becomes even steeper and narrower. We then climb over a ridge and descends to a wooden bridge then continue along the ups and downs along the valley floor to the confluence of the Suli Gaad with the Pungmo Khola. From here the trail to Phoksundo Lake and Shey gompa follows the west bank of the river. We climb through a forest of big cedar to a good camp site and then on to Palam (3710m), a winter settlement used by the people of Ringmo village. The houses are almost burried in the sandy soil. The entrance station for Shey Phoksundo National Park is at the south end of the village. After our park entrance ticket is examined, we may be subjected to a baggage inspection-ostensibly for drugs and stolen art objects. It's very peculiar formality in this remote locale. We continue on the route, which switchbacks steeply on a sandy trail through open country to an elevation of 3300m, then we start up another steep set of dusty switchbacks to a ridge at 3780m. From the ridge there are distant views of a spectacular 200m -high waterfall, the highest in Nepal. The trail makes a steep descent in birch forests to the upper reaches of the brilliantly clear, rushing waters of the Phoksundo Khola, then we climb gently to Ringmo village, a picturesque settlement of flat-roofed stone houses with lots of mud -plastered chortens and maniwalls. Just below Ringmo, we cross a bridge and follow a trail north to the ranger station at Phoksundo Lake (3730). We continue to the shores of the lake near the point where the Phoksundo Khola flows out of the lake. There are national park camping grounds on both sides of the river on the south-east shore of the lake. Park rules prohibit us from camping in other places. A trail leads from the lakeside through juniper trees to the white Pal Sentan Thasoon Chholing gompa, a ramshackle Bon-po gompa overlooking the lake that is said have been built 60 generations ago. There are five other private gompas in various houses of small monastic community near the lake. The insides of the temples contain dusty Buddhist paintings and statues, but the trappings also reflect the animistic elements of the Bon-po religion, so some of the chapels are reminiscent of an ancient witch's cavern. A donation to the ragtag collection of dirty monks will gain us entrance to the gompas; our sherpas will be equally fascinated by the strange iconography and practice of the Bon-po religion. From our camp site near Ringmo on the southern end of Phoksundo Lake, the trail contours on a rocky ledge as it skirts the western lip of the lake. In places it's precariously suspended on a gangway of wood supported on pegs driven into crevices in the rocks. As we cross a stream, look up at the glacier descending from the upper slopes of Kanjeralwa (6612m). We then climb to a crest at 4060m for a spectacular view of the lake with the snowy peaks of Sonam Kang in the background. The trail makes a step and dusty descent through birches and blue pines to the westernmost edge of the lake at 3630m where the Phoksundo Khola enters. The route now heads west up a long a wide valley. We follow an indistinct trail through thorn bushes and scrub trees, crisscrossing boggy marshes and tributaries of Phoksundo Khola. We camp in a forest of blue pines at Chunemba, an undeveloped national park camping ground at 3630m. We begin the day along the level path that now heads north through a glacial valley. We then cross to the east bank of Phoksundo Khola. We follow the main valley for another hour to kang Gompa. We climb steeply from Kang Gompa and stay on the grassy ridge. It's a long climb up the ridge past a few groves of birch trees. There are spectacular mountain views with Shey Shikar (6139m) and Kang Chunne (6443m) dominating the skyline to the west. We continue on a crest at 4200m then the route descends gently on a rocky trail to Lar Tsa, a camp site besides the river at 4120m. It's possible to continue walking, but we have now ascended more than 500m in a day and should spend the night at Lar tsa for acclimatisation. We cross a new bridge and climb to the top of a scree slope at 4490m, then make our way up a grassy ridge to a crest at 4640m. We contour and then drop gently into Mendok Ding (flower valley). We again climb alongside a stream to a campsite at 4610m. You are almost certain to a spot herds of blue sheep on the slopes above the camp. we continue on the route that follows the upper reaches of the Phoksundo Khola, and then we turn north towards the peak of Riwo Drugdra (Crystal Mountain). There is a choice of trails here; we follow the more scenic pilgrim route across the Sehu La to the west of Crystal Mountain, making a kora (circumambullation) of this sacred peak. The Dolma trail turns north soon after camp while the pilgrim trail starts up a steep scree slope on the opposite side of a stream that flows from the north. After a long pull to Sehu La (also known as Mendok Ding La) at 5160m the trail descends a scree slope to a grassy meadow besides a stream valley and begins a series of long ascents and descends across ridges in and out of side valleys as it traverses around Crystal Mountain. After a steep, rough climb to a crest at 5010m and another at 4860m, we begin the descent to the Tar valley. Soon after the route reaches grassy slopes a side trail leads to Tsakang, a gompa said to be 800years that is perched dramatically on the side of a cliff. The final descent is on a wide trail to a campsite in a large meadow near a few nomads huts at 4310, just below Shey gompa. the Shey gompa compound at 4390m. The gompa itself is not large ,and there are no artifacts or paintings of note inside. Although the building is said to be 800years old, the wall paintings are relatively recent, probably done in 1970s. The statues on the altar are of Guru Rimpoche, Sakyamuni and Milarepa. The gompa also houses an ancient Tibetan scroll that describes the myth of Crystal Mountain and Shey gompa. According to the inscription, there is a holy lake in a crater among the mountains that surrounds Shey. When a pilgrim makes nine circumambulations of this lake the water turns milk. A sip of this milk, and the pilgrim can se Mt Kailash in the distance. So for those who doesn't need the day for rest, we will go and try to find this lake. We trek east from Shey gompa and across the 5010m Shey La. Here we turn north and descend before climbing again to Namgung (4430m). We traverse high above the Namgung Kola to Karang (4050m). It's also possible to descend to Saldang on the banks of the river, but this village holds little of interest. We descend to Torak Sumdo (3670m), the confluence of the Namgung and Polang kholas, and cross to the northern bank. We then climb to Yanger gompa at 3750m and trek along the river side valley. We camp at one of the camp sites alongside the stream at about 4100m before Mugaon. We continue up the valley to Mugaon and climb towards the Mushi La at 5030m. Then we descend towards Shimen village, we end the day at a good camp site in pastures above the village at 4010m. We drop down to Shimen village at 3870m and make a long trek upriver through Pha (4090m) to Tinje (4150m). We trek past the runway of mysterious Tinje airport to a trail junction at 4130m, where a high route leads to Tarap. We continue southward to a camp site on the banks of the river at Rakpa (4530m). We begin our day with a long climb to the Chharka La (4920m). We continue on the trail descending along the side of the valley, then make a big drop into a side valley at 4290m. We then make a long traverse down to the picturesque village of Chharka on the banks of Barbung Kola at 4120m. Another Climb to acrest at 4380m begins this day. We then descend again to a river. We follow the right fork southward, climbing in and out of side valleys on a rough trail. The valley narrows, we then emerge into a big meadow and climb to our campsite at Norbulung (4750m). We begin the day climbing to a yak pasture at Molum Sumna (4860m) and on to a crest at 5130m. We then make a long traverse across meadows to the foot of the Sangda La, then a long, steep final climb to the pass at 5460m. Swirchbacks down to our camp site by a stream at 5100m. We climb to a lower Sangda La at 4990m, then descend through loose shale towards the village of Sangda Ghunsa (4190m). We drop to the Chalung Khola, crossing it at 3750m, and then climb steeply up the opposite bank. A long high traverse leads to a cairn at 4090m, we then come to a set of steep switchbacks descends to a stream at 3580m. We do another climb to the compact settlement of Sangda, were we end a long day at 3700m. We climb the hill behind Sangda and spent most of the day making a high traverse, crossing nine ridges to a final crest at 4280m. We then descend into the Kali Gandaki valley, traversing under high cliffs and descending to the large village of Dhagarjun (3290m). We climb to a ridge at 3360m and make a final descent on a challenging trail of loose rocks to Jomsom at 2670m. We take an early flight from Jomsom to Pokhara - a fantastic way to round off the trek, flying right along the Kali Gandaki Gorge between the Annapurna and Dhaulagiri ranges. In Pokhara we check into the Hotel, get the dust of the last three weeks washed off and head out for a nice dinner..! Day 25 Drive / Fly Kathmandu. AM: Breakfast at Hotel. Visit 2000 years old shrine Swoyambhunath Temple, which is also known as temple of monkeys. It is said that Asoka paid a visit to the site 2000 years ago. By 1200s it was an important Buddhist center. Visit colorful Durbar square known as Hanuman Dhoka Palace, Temple of living goddess Kumari, Jagannath temple known for its colorfully painted wood carvings and Kasthamandap temple a three story pagoda style. It is believed that this temple is built from single tree in the 12th century. AM: Breakfast at Hotel. Free time till departure to Airport.